Urban Gardening Ideas, from Rooftops to Small BackYards and Containers. There is no such thing as no space to garden, as these photos will attest. You can always squeeze in a container or two, even if it's on a shelf in the bathroom. Urban gardening takes many forms. Some urban gardeners make use of the small patch of soil near their front stoop, other head to the roof top. Some are even lucky enough to have a bit of lawn. Use this photo gallery to garner ideas for your own garden and then feel free to show it off and tell us a bit about your urban garden. 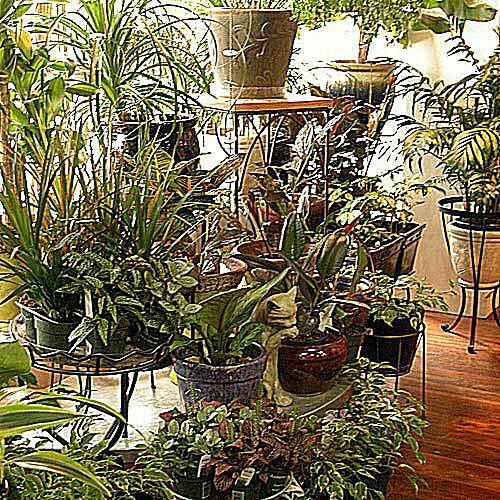 The most common gardening fix for urbanites is houseplants. The good news and the bad news is there are lots of them to try. Having lived in some very small apartments, I can testify that plants eat space. But they make wonderful roommates; quiet, undemanding, they'll watch whatever bad movie you put on the TV. These 7 Houseplants are almost fail safe, if you'd like to get started. It's considered a hazard to put containers on a fire escape, but many people can't resist. It's often the only spot that gets sun. I have seen everything from a pot of basil to a 4-foot Brugmansia. Way up on the umpteenth floor, surrounded by other buildings, there really isn't much sun or space for a garden. This window box is the only one on the facade and it makes such a statement. It's a triumph. Imagine throwing open the curtain every day and watering these cheery flowers. It's much better than a bunch of cut flowers in a vase. A lot of cities are taking the lead in bringing the garden into town. Don't overlook the containers in front of buildings and along the streets, when you go looking for inspiration. Yucca, Plectranthus, Strobilanthes (Persian Shield) and, of course, the colorful sun Coleus can all handle the abuse of city heat and pollution. Even some small towns have their space limitations and gardeners should take their cues from their urban counterparts. This gardener is just starting to spread out. She started with a windowbox and some easy care, repeat blooming daylilies. Now hooks are popping up on the side of the house and containers are sprouting in the driveway. Even the small lawn is giving way to curving boarders. You never know how much space you have, until you start spreading out. Whether or not you actually sit on your front porch, it can still be a great place to grow plants. Pots along the steps, boxes on the railing, hanging baskets and a few well chosen shrubs for privacy may be all you need to feel like you have a garden. You can even use it to grow edibles, especially herbs. A word of caution about that hanging basket over the stairs: Make sure it's high enough that you are not banging into it on the way in and watch out when you water it. It takes awhile to get the old world charm of walls covered in creeping vines, but this entrance in the Historic District of Savannah makes use of hardy native grasses, like liriope, for ground covers, as well as using one stately palm as a striking focal point. This gardener was not deterred by limited space in the backyard. The front yard is planted right out to the street and over the curb. Many cities and towns have rules about what can be planted close to the street, because of visibility concerns. For most gardeners, the concern is what will survive that close to hot hardscaping, car fumes and winter salting. The shrubs here are taking it in stride. Many urban homes have small front yards. Rather than wasting the space on some sad looking yews, take advantage of what you have. Start with a few colorful or flowering shrubs and build from there. Soon the whole house will be surrounded. Even the neighbors caught the bug here, carrying the colorful effusion down the road. This shrub and perennial boarder is no more difficult to maintain than trimming the yews would be and they bring much more pleasure. I wonder who planted first. The folks in these 2 buildings might never know they lived in a city. They've created a woodland fantasy in the middle of a somewhat commercial area of town. Everyone can't afford to do something on this large a scale, but start small and you'll see how much you gravitate outdoors and how plants just seem to follow you home. Can you tell what's beyond the screen behind the table. I can't and that's the whole point of this planting arrangement. I'm not sure how they manage to sit at this table, but planting in containers gives this garden flexibility. Of course, with no soil, there weren't many other options. Grow where you're planted. Sometimes all you want in your backyard is a place to relax and toss a ball around. Lawns are a precious commodity in urban areas and this homeowner does theirs justice. This is a lawn for hosting a party and sipping champagne. A lot of new homeowners have no idea how to care for a lawn and that's especially true for folks who have been raised in a city. If that strikes a chord, here are some small lawn tips from About.com's Lawn care Guide. Small urban lots often have less than attractive fences. They may provide privacy, but you still have to look at them. This weathered gray fence makes a nice backdrop for a small garden of greens and textures. It's shady back there and you can see that the grass isn't very happy, but it's perfect for spreading Hosta and climbing ivy. This small backyard looks more like a woodland. The 2 trees add height and architectural interest. The dappled shade comes from the fence and nearby buildings. They create the woodland feel with creeping ground covers, ferns and stone. Here's another take on creating the illusion of space in a small backyard. Rather than a woodland, this path is spilling over with a cottage feel. The path leads to a bench, with a view back at the garden. You don't need a lot of space to create a garden escape. This little retreat makes use of a side yard along the street. Some gardeners look at mature trees as a handicap for creating an urban garden, but they clearly were put to good use in this design. If you have the space and you're a devoted vegetable gardener, maybe raised beds are the way to go. What's nice about these structures, besides being able to bring in fresh soil, is that the yard is able to maintain some degree of order and formality, despite being so profusely planted. And just think of how many vegetables you could be harvesting if you turned your whole backyard into a garden! This rooftop in Oregon is a demonstration rain garden. Soil, gravel and plants are carefully placed to absorb and purify rain water as it is directed into a cistern below. Rain gardens are a great way to control pollutants that can get caught in runoff water and make their way back into our water supply. Ground level water gardens are good do it yourself projects, but putting one on your roof really requires some professional consulting. Living walls, walls with special fixtures that allow you to plant vertically, are becoming increasingly popular. They can be difficult to maintain because they're hard to water and the plant's roots don't have very much room to develop, but I've seen some that were very impressive. This is a display at the Philadelphia International Flower Show that makes use of a lot of tropical plants. Generally I've seen them done with either creeping plants or some type of succulent, like sedum. Plants that are drought tolerant seem to work out best. With a small corner of open air to call their own, this gardener has somehow included trees, clinging ivy, a dining spot and even a couple of pieces of garden art. They have personalized and otherwise wasted space. This gardener has brought the country to them. There are built in planters, wind chimes, a storage shed, awning for a little shade and even a trough of grass. It just goes to show that you can built any style garden you covet, anywhere you live. How about this for a view. You would hardly know you're living in a high rise. I wonder if ivy was the first green wall? Look closely at how many trees are on these terraces. There are also several clustered containers and a nice use of red and orange foliage, for contrast against all that green and as a complement to the brick.